Here is one of our family favorite meals both because it's tasty and easy to prepare. The secret ingredient is a package of onion soup mix! Shh...don't tell the chefs at Le Cordon Bleu! They would want you to make French Onion Soup from scratch and dehydrate it yourself! 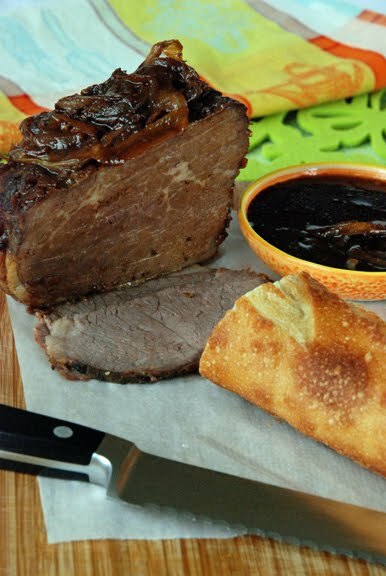 Dry the roast with paper towels. Rub or sprinkle with dry mustard, oregano, salt and pepper. In a large roasting pan, heat the vegetable oil over medium high heat. 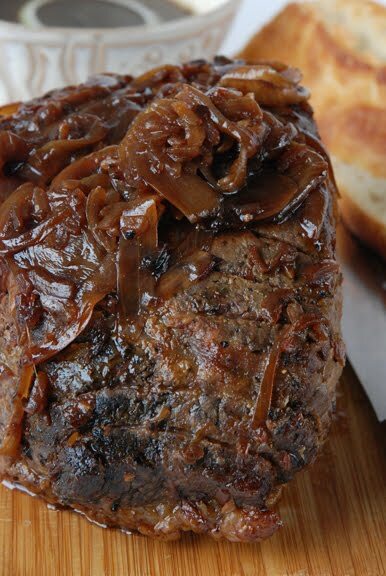 Brown roast on all sides. Set aside. Add the onions to the roasting pan and cook until tender, about 10 minutes. Add the water, soya sauce, onion soup mix and garlic. Return the roast to the pan. Roast in the oven for 2-2½ hours until cooked to desired temperature. Thaw overnight in the refrigerator. Heat the slices and dipping sauce in the microwave. Had to smile when I saw beef dip. This is also a family favorite of ours. Wonder if it is a Saskatchewan thing? Hi, I love that you used such a home cooker ingredient such as dehydrated onion soup! I'll sure try making this roast - just the kind of meal I like to prepare at home and then use for several different dishes (salads, fry noodles, tacos, etc). And I guess it's a universal dish (I live in Rio de Janeiro!). I also wanted to share another GREAT onion soup use with you: combine one package with a small bottle of stout beer (dark and sweet, doesn't have to be the best brand) to roast chicken legs and thighs - works well in a pot or in the oven. You get a creamy and sweet and thick and shiny sauce... yum! Add some cashew nuts during cooking, and it looks and tastes heavenly! Thanks for sharing your recipes! Beautiful blog! How sneaky! But I like this...looks so good! I love "Auntie Joyce's" recipe! Sounds super-homey. ive never tried this before! but sound and look mighty tasty!! Pfft, LCB also don't use soy sauce, so what do they know? ;) (Pardon my Asian-ness, I can't help it!) I am seriously craving this sandwich right now!!! Oh, I which I had that for dinner. It's a rushed tired night and was pizza slices and a Caesar salad. They were really good pizza slices, but that looks better. Mmmm this looks like a delicious dish! I just received a bread book in the mail, so maybe I'll make this with some freshly baked bread to accompany. I'm hungry now! Auntie Joyce knows her stuff. This looks incredible. And I always use the onion soup mix-- in hamburgers especially. It's funny how I catch myself being a food snob with some ingredients and I know that's not the way to live life, but I always love the onion soup mix! That sounds fabulous. My family loves anything you can dip, so this would be a huge hit with us. Mmmm! This looks amazing! It is totally on my must-try list now. Oh wow! this looks sooooooo good! I think ill have to try this one soon!